This past week, I began teaching a new session of Couponing 101 through the Adult Education program. As I began class, I started with a small list of things these new couponers would need to change in order to be successful. They ended up with lots of questions about the new methods and it made me realize that I probably take some of them for granted so I thought I’d better explore some of these habits a little more in depth for our readers! Never leave home without yourcoupons! When you have decided to take control of your finances and you want to have better management of how you spend, there are some habits you have to break and some mental shifting needs to occur. I can teach you how to use coupons in order to save money on your groceries, but if you don’t adopt new attitudes towards shopping, you’ll never see any success. Here are your Seven Savvy Shopping Strategies! Set a budget. I thought this was a no-brainer but I’ve learned differently. People, it starts right here! If you don’t know how much you spend each month on groceries, you’re in trouble! Seriously, this is huge! Spend the next couple of months tracking what you spend (save every receipt!) and then sit down and look at. See what you are buying and if everything you buy is necessary. From this data, you can then set a dollar amount for your monthly groceries. Be realistic and honest when you set this budget and then be consistent by sticking to it each month! The amount can be adjusted after some trial and error. After you start to use coupons to your advantage you’ll end up having a surplus of cash each month in this budget…hmm, that’s a nice problem to have! 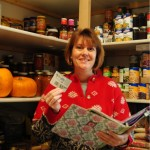 Plan your grocery list from your coupons and the sales each week. Most people do it backwards, they make their list based on what they want or need. But savvy shoppers know that we base our shopping lists on what the sale flyers are offering and what coupons we have clipped. Just by following this simple step, you can save around 15% of your budget right away! Amazing! Make your shopping lists based off the weeklyads. Get into the habit of never walking into the store without coupons and your list. We’ve talked before about how dangerous it is to just walk into the store empty handed…it leads to leaving with a shopping cart loaded to the top with full-priced items and items you don’t need. Make your list (read #2!!) and grab your coupon binder and head into the store confident that you will not be fleeced of your savings! Never, never settle for full price! I can’t believe in this day and age people still buy groceries for full price! Remember that by using coupons, you control what you pay for an item. Also, by knowing that sales are on a cycle, you’ll learn patience and wait until that sale comes around. The least you can do is to buy the generic brand vs. buying the brand name at twice the cost! Your key to never buying things at full price is to learn how to stock up wisely. Once you have a stockpile of household goods, then you should never run out of anything, thereby forcing you to run to the store and buy at full price. I have things like toilet paper, deodorant, toothpaste, paper towels, ketchup, copy paper, and other household and kitchen basics stocked up and I manage those items well so that we never run out. View your coupons as your currency. This sometimes is a big change for people because they don’t value coupons for what they really are worth. A lot of times when I go to the store, my coupon values total more than the cash I have in my wallet. This is the ideal…spend more coupons than money! Give up brand name loyalties. Again, sometimes this is a hard habit to break. It’s not one of those rigid rules you have to follow, but if you can be flexible and use various brands you will save more money. But don’t fear, if you absolutely are wedded to a certain brand, you can still save money by using coupons for that item and waiting for it to go on sale. Plus, I view those items as another reason to coupon…if I want/need to spend money for higher-end brands, then I can balance it by using coupons to get other items for free or almost free, allowing me more money to spend on that higher-end, brand name item! Get it? These are just guidelines for you to be successful when you coupon. In my experience, people hear the hype about saving money using coupons and they immediately want to jump on board without doing any shifting in their mindset or habits. Unfortunately, they go gun-ho using coupons but then don’t see any savings so they give up and say it’s not worth it. It’s just like changing the paint of a bright red wall to white…you have to take the time to prime it and put a base coat on otherwise no matter what you do, the red will keep peeking through. So, if you are serious about seeing the financial return on your coupons, take the time to prime your mind and shift some of your shopping habits!